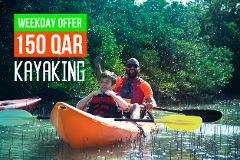 Kayaking Exploration of the mangrove channels in Al Thakhira. FREE BBQ SETUP AVAILABLE Refreshments, Water, Portable toilet, Changing facilities, Carpets, Chairs, Pillows, Grills, Charcoals etc. Kayaking between old Dhows, overlooking Doha skyline and the Museum of Islamic Art. Enjoy an African Drumming session with a professional drummer from Ghana on the beach. Kayaking at Al Thakhira mangroves during the Super Full Moon, a phenomenon which happens once every dozens of years! Enjoy an unbelievable experience of Purple Island Camping adventure. A great tour for all ages including singles or families. We explore the Al Thakira nature reserve. Let`s join efforts and help the Mangroves! We have a lot of beautiful places with mangroves, like a Purple Island, Al Thakeera Mangrove forest, Fuwairit Beach but there is a lot of garbage everywhere. And we have to help mangroves! This is the unique opportunity to enjoy the island for tourists, families and adventure lovers. 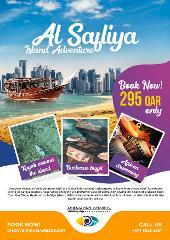 Super Great opportunity to enjoy kayaking during Ramadan Month.